Have you heard the one about email marketing? You know, the school of thought which claimed that it would slowly decline as social and digital communication channels took hold? This prediction has proved to be wide of the mark, with email marketing continuing to thrive and serve as one of the four most effective drivers of digital traffic. While it is easy to be dazzled by the diversity and real-time nature of integrated social media profiles, it is important to remember the core metrics of any successful marketing campaign. The most obvious of these metrics is profit, as marketing must effectively mobilise your target audience while translating into a positive ROI. In this respect, there is evidence to suggest that email is the single most effective medium for marketing your business. According to studies, email marketing delivers an average ROI of 4400%, with a $44.25 return for every single $1 spent. Much will depend on your execution, of course, with the use of personalisation and informative, dynamic content central to optimising the ROI of your email campaigns. Mobile optimisation is also a key consideration, especially with more than 55% of all emails now accessed through a handheld device. Of course, the delivery of an inflated ROI means little if you are unable to reach a large or motivated audience through your chosen marketing channel. This is why social media marketing has proven so popular during the last seven years, with Facebook alone now boasting 1.71 billion active users each month. Email can more than match this, however, with a total of 4.9 billion email accounts expected to be active across the globe by the end of this year. This will represent an increase of more than one billion since 2013, and it highlights the growing popularity of email as a core communication channel. So while you will still be required to target specific demographics through email marketing, the sheer volume of individuals who use email on a daily basis enables you to maximise the amount of consumers that you reach within each segment. With the use of personalised content and in-depth consumer data, you can also optimise the number of leads that are successfully converted across your audience as a whole. By itself, the revelation that U.S. consumers interact with an average of 11 brands through email each day means relatively little (even though this is a trend that is repeated across the globe). When placed into the correct context, however, it offers yet another compelling reason to prioritise email marketing in the year ahead. Consumers only interact with an estimated nine brands through Facebook on a daily basis, and eight through the popular Twitter platform. This underlines the fact that customers have become increasingly receptive to branded communications through email, particularly as the security measures and filters utilised by major platforms such as Gmail and MSN have improved over time. Not only this, but email has also benefitted from the emphasis that brands have placed on content marketing during recent times. After all, companies have looked to refine all aspects of their content in the quest to get higher on Google, with the need to create in-depth, personalised and topically relevant copy more pressing than ever. These principles have also been applied to email, which in turn has allowed brands to engage customers and convert them more effectively. To capitalise on this further, strive to customise your email content to include the name of each recipient. Beyond this, ensure that your calls-to-action are placed above the fold and not overly promotional, as they should offer a natural hook and relate seamlessly to the nature of the content. We have already touched on the potential of email as a profitable marketing tool, and this was nevermore evident than during Black Friday in November 2015. In fact, email marketing accounted for a staggering 25.1% of all sales that were completed on Black Friday, while the rate of e-commerce transactions also increased by 16.1% during the same period. This is a statistic that supports the impactful nature of email marketing, and more specifically its unique ability to generate and convert a relatively high number of leads. With a growing number of consumers now receptive to branded emails, carefully crafted and well-timed communications can have a significant influence on real-time customer behaviour (the below example underlines this, as it was a real-time promotion targeted at customers during a typically quiet Thanksgiving evening). This not only means tailoring personalised email content that is relevant to specific events and consumer holidays, but it also demands a precise approach to the timing and the presentation of your correspondence. Specific consumer demographics are more likely to access their emails at different times, for example, while 43% of respondents under the age of 30 cite design and layout as the most important conversion factor. So there you have it; four statistics which make compelling (and not to mention interesting) arguments for the use of email marketing to reach your audience! With the data on your side, is there really anything stopping you from building your email list with confidence and improving your ROI? The tourism industry is booming and, nowadays, more and more people decide to spend their free time on a paradise island or on board a cruise ship (who wouldn’t?). This increasing urge to travel has contributed to a more competitive industry, where companies need to stand out and keep up with the trends.That means tourism companies have to move fast, be flexible and react to their customer’s actions right away to be successful and perform better than their competitors. Transactional emails contain information following a transaction your client has started, either to complete it (like account creations) or to confirm it (invoices, for example). Payment and booking confirmations, travel documents or plane tickets are common transactional emails, which get send out to an individual recipient instead of a big group of contacts. You might have also heard about them under the name trigger emails before, since they get triggered by a customer’s action. So far so good, but why does the tourism industry have such a big need for transactional emails? Transactional emails in the tourism industry are key, yes. It is now inconceivable to have a travel company operating online and not working with this type of triggered messages. But that’s not it. Transactional emails are much more than necessary, they are like champagne on an airplane. Without champagne the airplane ride is just a boring and never-ending trip and you end up thinking you might never arrive. But with a glas of the finest champagne, even people with fear of flying start enjoying the trip and the flight seems to fly by (see what we did there?). Transactional emails are like champagne. They make it so much easier and faster for your customers to actually enjoy the vacation, without having to worry about whether the travel documents will ever arrive in their mailbox. In the era of digitalization, more and more clients are booking their holidays online to save money and time. To keep up with this trend, tourism companies need to send their booking confirmations, travel documents as well as tickets per email, instead of using the old-school mailing system. Even travel agencies that offer offline services shouldn’t miss out on the opportunity to send all important information via email. Just imagine how good it would be to end the struggle with your printer. Your transactional emails only have to be designed once, and will be sent out to your customers automatically after every booking. That way, you can save time and focus on more important things. Most tourism companies recognise the value of transactional emails for their business, but still don’t know what consequences they could face if they don’t track these emails regularly. “Don’t be so negative! What could happen? All my transactional emails are designed and optimized, nothing’s going to go wrong…”. So you think. do nothing, but tell all his friends about what a bad customer experience he had, and how he will never book a trip with you again. No matter what happens, your company’s reputation is damaged and your customer satisfaction decreases. Because of that, your number of bookings drops, and so does your revenue. And all this, just because you never noticed that your transactional email didn’t get sent, got blocked or landed in Spam. But don’t worry, there is a way to ensure you’re ready to take action before it gets to this. The solution is called Real-Time Monitoring. So what is this magical tool, Real-Time Monitoring? Real-Time Monitoring is a tool developed by Mailjet to track all your transactional emails in real time. It allows you to set alerts that will notify you by email, Slack or SMS* if there is any kind of issue with your transactional emails. So whether it’s unusual statistics, non-delivery, blocks or delays in sending, you will be able to react quickly and prevent these issues from damaging your business. For tourism companies, this means the possibility to control all transactional emails, to be able identify problems right away and ensure customers receive their valuable travel information. Real-Time Monitoring also allows you to identify what type of transactional emails didn’t get send, so you can set specific alerts for your company’s most critical messages. You’ll be able to group these important documents, or divide them in different categories such as billing, travel documents or booking confirmations, to ensure you’re tracking these messages together so you can react quickly to solve problems before they become serious. With Real-Time Monitoring, you’ll gain more flexibility and will be able to ensure that all your customers receive their booking documents. Your customer satisfaction and the trust in your company will increase. And as a result of this, your number of bookings will rise and so will your revenue. Sounds good? Mailjet’s Real-Time Monitoring is available on Crystal Premium and above. Create an account today and try it out alongside our other Premium features, with our free 30-day Premium trial. Start tracking your transactional emails and take your tourism business to a new level! Have you already started tracking your transactional emails with Mailjet’s Real-Time Monitoring? Share your experience, ideas and thoughts with us on Twitter, or just come along and say Hi. There is a common belief that the Internet’s language is English by default. The truth is that 70% of Internet users, even if they do understand English, are in fact non-native English speakers. In the “Can’t Read, Won’t Buy” report, Common Sense Advisory found that 75% of customers prefer to purchase products when targeted in their own language. This means that if your competitors have already translated their communications and you haven’t, they already have a higher chance than you do to reach your shared audiences. opening up your English email campaigns. Sounds like a missed opportunity, doesn’t it? If you’re looking to expand your international reach, you might want to think about localizing your email campaigns. We’ve partnered with Translation Exchange, a cloud-based localization platform that lets you translate your Mailjet email templates into other languages. Translation Exchange offers both machine and human translation. Automated machine translation is helpful and time-saving, but sometimes, a machine translation is just not enough. Professional translation agencies are directly integrated in the platform to provide you with that unique local flair that only human translators can add. For hassle-free localization projects, the platform also offers a direct messaging feature for developers, translators and project managers to collaborate. Love it already? Wait til you hear this. Translation Exchange not only integrates with Mailjet, but also with your favorite CMS and marketing automation platforms. Why is this cool? Translation Exchange’s technology allows shared translation memory. This means that you never have to translate the same content twice, and, most importantly, that your brand voice is consistent across all the communication channels you use. Create your Translation Exchange account. Connect your Mailjet account with Translation Exchange. Import your Mailjet templates on Translation Exchange. Order professional translations in 100+ languages directly from your dashboard. Click ‘Publish’ on Translation Exchange to receive your translated templates in Mailjet. Every country has a culture of its own, and translating your original message to another language is just the first step of localization. For example, if you’re in the US and thinking of sending a Fourth of July Special Sale Email Campaign, you might want to go with a different messaging to target subscribers that are based in other countries. Take a closer look at your subscribers’ local cultures to make sure that your message fits in with their references. Words and phrases can vary from one language to another too: for example, you’d need to use a familiar form to promote your product in Italian, whereas you’d have to use a formal form in French. This is also valid for colors, design… even emoji preferences in email subject lines aren’t the same across all countries ! the US (left) and Italy (right) : same message, different messaging. And by time, we don’t just mean time zones. Of course, you need to be aware of the time zone your target subscribers live in. But what you also need to keep in mind is that the typical workday is not the same in every country: as much as we wish we did, we don’t all get the Spanish siesta. Do your research on what the common habits are in your target markets to ensure you land in the inbox at the right time. Last, but definitively not least, be aware of the anti-spam laws that are applicable in your target countries. Just like cultural references and habits, email regulations are not the same everywhere. The easiest way to ensure that you’re in a good place legally to target the country you want to is to check for your ESP’s Terms of Service – if you use Mailjet, you should have no problem: since our servers are based in Europe, our service guarantees full EU-Data compliance, which is among the strictest level of email data security. Email marketing has evolved from not-so-attractive plain text emails to amazing HTML emails that we all admire today. We wouldn’t say that plain text emails are no longer useful; they have their advantages. But when text is coupled with visuals, the impact is far superior to text alone. With a smartphone in every hand, more that 50% emails are now viewed on mobile and that too on the go. We are thus being pushed by the need to create shorter, to-the-point, noteworthy emails. Rich media like images, GIF, cinemagraph and video add that special element of surprise to keep subscribers engaged with your emails. Combine text with some amazing images of your selected products or services. Create a GIF displaying the various design options available in a product. Create a cinemagraph focusing the attention of the subscriber on a certain part so as to highlight the unique selling point. Embed a video of real world implementation of the product/service. Rich media has numerous advantages but there are also a few challenges marketers need to deal with, one being that of email client support for rich media. EmailMonks’ new interactive infographic throws light on everything one needs to know about Rich Media in Email Marketing. Check it out. BONUS: There is also a free ebook to throw light on the most imminent problem – How do you decide when to use GIF, Cinemagraph or Video in your email. With the increasing digitalization of most of our administrative or banking tasks, emailing has become a favored communication channel for both the financial and governmental industries to communicate with their users and customers. The piles of paperwork to validate a loan or to fill in your tax return are pretty much a thing of the past. But the rise of emailing in these industries means that they have to face new challenges. Even though email is a quick, cheap and highly customizable way to contact their customers, these companies still have to be sure that these emails actually reach their recipients’ inboxes, and that the extremely confidential data they’re sending is completely safe. But, how can they be sure their emails will have the best deliverability and security possible? The technical solutions to reach the inboxes of your recipients. The legal and technical aspects of email security. The different processes set by Mailjet to get your emails properly delivered and secured. Interested in an Enterprise Plan? Contact our Team here. Transactional emails are at the forefront of most businesses today. Whether you are directly selling online or operating part of your business through the web or apps, you need to set up account creation emails, password resets, booking or order confirmations, invoices, shipping notifications and a wide range of alerts. We’ve all been someone else’s client, we know how highly anticipated these emails are. They confirm the transaction has successfully taken place and usually provide really valuable information, which explains why these messages have the highest engagement rates. Transactional emails are critical for the business execution, but a lot of sand grain can thrown into the gears. Sometimes an issue with your web application, payment gateway, server configuration or connection with your email service provider can disrupt your sending. Or your website could be hacked to send numerous emails to non-existing addresses. All of a sudden, your shipping notifications start ending up in the Spam folder. Your clients are not receiving their train tickets because the emails are rejected when they try to reach the inbox. Your open or click statistics start dropping dramatically without you even noticing. It can take long to discover these issues, which could severely hurt your business in many different ways. Not sending account creation emails can damage customer acquisition. Customers no longer receiving their tickets or their purchase confirmation will lead to extra customer service workload, with loads of angry clients wondering whether their transaction’s been completed and where their money’s gone. Repeated bounces in key service information can ultimately drive loyal customers away from you, leading to a direct drop in revenue. All in all, both your brand reputation and your ROI can be severely impacted if your transactional email goes wrong. So how can you ensure these issues are promptly identified? Mailjet is the first email service provider that enables you to have a constant supervision on your transactional feeds. Not only will you be able to set up monitoring for your business’ critical emails, but you’ll be the first to know if anything goes wrong, allowing you to save time and money, and improve customer experience. Mailjet’s Real-Time monitoring will inform you by email, Slack or even SMS* in case a problem arises, to be able to quickly troubleshoot and identify the cause of the issue. This way, you’ll be able to address the matter and resume your transactional sending in no time. To make it easier for you to monitor your alerts, the first step will be to name each monitoring category you think could be useful. Think about what make the most sense for your business. It could be to split your messages into groups of emails with the same purpose, the same deliverability patterns, or even to group all the emails which are critical to your business. 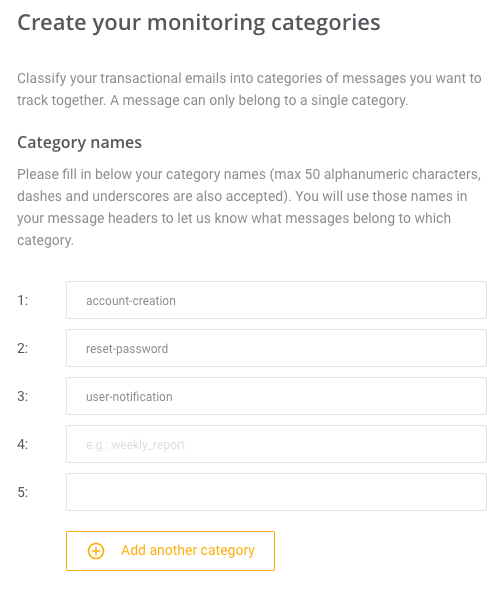 Once you’ve created your categories in the Mailjet interface, you can go back to your transactional messages to add the category in the headers of each transactional email you wish to monitor. When your categories are defined and applied to your messages, you can proceed to the setup of monitoring alerts. Our Real-Time Monitoring’s intuitive interface enables you to create your alerts with a step-by-step wizard, based on pre-defined alerts rules. No coding required! Messages not sending: triggers a notification when emails are not sent or delivered at all for a certain period of time. Error on critical message: alerts you each time a message is blocked by our systems or bounces from the recipient’s inbox. Delivery delay: notifies you when emails are delivered slower than expected. Unusual statistics: sends you an alert when delivery, bounce or open rate are lower or higher than your predefined threshold. Because you’re not behind you laptop 24/7, email is not the best channel to let you know about your transactional sendings. And because your company won’t have the same level of engagement at all times throughout the day or even throughout the week, some moments might require closer monitoring than others. Mailjet’s Real-Time Monitoring lets you define the time and day during which an alert is active, and the channel that should be used to notify you. This way, you could schedule alerts on Slack and by email on weekdays, during the hours on which you are at the office, and create the same alert to be notified by SMS* outside working hours. Thanks to Mailjet’s Real-Time Monitoring, you have complete control of the emails that matter the most to your business and could drive an important part of your revenue. Aside from these alerts, you also have access to a monitoring dashboard that serves as a control tower for your transactional emails. Mailjet’s Real-Time Monitoring is available in Crystal Premium plans and above. Create an account today, and experience it as part of our Premium Features. P.S. Do you need help to create your transactional emails? Discover our step-by-step Templating Language tutorials to create your emails using MJML, our open-source email framework. Not so long ago, we told you Orange Email was closing down. It seems like EE are not the only ones that have gone on a spring cleaning spree, and it’s now Terra who’s also embracing this “out with the old, in with the new” philosophy. Although the website will still be available, on June 30th, Terra is closing down its freemail service. If you had just recovered from the Orange Email news, you might start feeling those hot flushes again. Or maybe you realized the emailing world didn’t end when Orange, Wanadoo and Freeserve closed down, and you’re now much more pragmatic when it comes to these unpredicted changes. Either way, we’re here to reassure you: this won’t kill your email strategy. Here’s what you need to know to prepare for Terra Mail’s closure. The first thing you’ll need to do, then, is to assess how many of your users will be impacted, and work on an action plan to ensure the closure doesn’t mean you’ll have to say goodbye to these subscribers forever. Let’s recap on the advice we gave you when we talked about the Orange Email closure. If you have a significant number of contacts using these domains, you can expect some spikes in your bounce rates. This is because the closed accounts won’t be accepting any new emails. High bounce rates can impact your deliverability, which is why at Mailjet we keep an eye on bounces and other metrics, to ensure you stay within our predefined safe thresholds. To avoid spikes in your bounce rates that could damage your email deliverability, just delete these domains from your contact list before June 30th. But before you do that, ensure you’ve reached out to your subscribers to get their new email addresses. First, segment your list to send these contacts a targeted campaign, reinforcing the value of the content you send them, and encouraging them to change their email address in your system, or create a new subscription with their new one. If your users update their contact details, be sure to thank them for providing a new address with a tailored welcome campaign. This will help you strengthen the relationship with them. Make sure you send those that haven’t updated their contact details a reminder email a couple of days before June 30th. A last reactivation attempt might go a long way if these subscribers missed or forgot about your first email. While it’s a great idea for consumers, sending from webmail accounts is definitely not the best solution for a mass email sender, at least from a deliverability point of view. These addresses look spammy and are more likely to be blocked by ISPs. On top of that, they don’t create the best first impression when introducing your business to potential users. Switching to a custom domain will improve your chances of landing in the inbox, and will also make your business look much more professional. There you are. We gave you all the details when Orange Email announced its closure, but these are the tips to ensure your email strategy survives the end of Terra Mail. If you’re looking to understand the impact this could have on your deliverability even better, check out our Email Marketing Deliverability 101 guide. Want to stay up to date with the latest email news? Sign up to our newsletter or give us a follow on Twitter! Our analysis of the direct marketing efforts of political parties exposes how campaign teams are failing to engage voters. If the general election campaign was based on direct marketing performance alone, the Scottish National Party will walk away with a victory and Labour will outperform the Conservatives. The Conservative Party only sent two emails throughout the four-week test period, achieving just 10.5 points (out of a possible 29.0), compared to the other parties sending seven on average. When it comes to subject lines the Green Party takes the lead, with 2.67 points out of 5, with Labour just ahead of the Conservative Party with 2.55 points against the Tories’ 2.5 points. We have all received spam at one point in our life – most of us receive it every day. Generated by bots and sent in bulk, spam and phishing email is actually not all that creative. Yes, it constantly adapts and changes in an attempt to outsmart email users, ISPs and ESPs to bypass their spam alarm, but not very fast (at least not fast enough to elude our very own phish-i-nator). This being said, patterns emerge and, here at Mailjet, we take time to systematically gather and analyze those patterns. Over the past few years, we’ve seen ISPs get smarter and move away from more traditional spam alarms. Nowadays, the focus is on user engagement, both positive and negative. ISPs learn from how we interact with the messages that arrive in our inbox, which helps them determine whether emails should go to the Spam folder or land safely in our inbox. So what does this have to do with the language used in your subject lines, then? Well, spammy words tend to be misleading, thus resulting in higher-than-normal user complaint rates. These complains, along with poor interaction from recipients have a negative effect on the sender reputation and, ultimately, impact the deliverability of future messages. Just imagine how many times you have received a subject line that includes the word “Free”. How many times has there actually been something that’s truly free in the email? Probably very few, which explains why now, when you read the word “Free” in your inbox, you generally just roll your eyes at a not-so-subtle attempt to get you to open a deceiving email. And if people do open the email and then find that there’s actually nothing really free there, senders can expect a high rate of user complaints that will impact their future inbox placement. So if you are looking to avoid those words that will trigger your recipients and ISPs spam alarms, we’ve got you covered. We’ll be sharing some of the most common spammer lingo we’ve seen to help you protect yourself but to also help you avoid being mistaken for a spammer, or worse, a phisher. The word “invoice” is a phisher’s favorite – if you see this word in a subject line, there’s a chance they’re trying to bait you in. Make sure to check the sender address to verify the email’s validity. billing@ex-ample.com is not the same as billing@example.com. Scammers try to profit out of our carelessness. Again a case where a legitimate name can be used for phishing. Scammers often try to impersonate financial institutions by sending emails with the same color scheme and layout, redirecting to a mirrored site made to look almost exactly like the one it is spoofing. As a consumer, follow the same steps above, verifying the sender address and domain name. As a marketer, use authentication tools DKIM and SPF to prevent spoofers from hurting your reputation. This is one you always see in your inbox – the “dear friend” scheme. Hundreds of thousands of emails are sent to people with a subject line claiming that you’ve won a big prize or that you’ve been selected for a sweepstakes you’ve never entered before. You have to be very gullible to fall for that one, yet scammers still send these by the millions since they are quick and easy to send. Variations of this “damsel in distress” scheme have made appearances over the years, where phishers pretend to be an affluent person from a far away country, who, being chased by wrongdoers, is forced to flee to a save haven. For some reason they have chosen you as the sole trustee of all their money and they promise great rewards for helping them open an account with a specific bank so that they can transfer their funds. To be honest, if I had a dollar for every African princess/prince and long lost lover that have spammed me, I would indeed have reaped great rewards by now! Gambling spammers often send out campaigns that promise high return, free entry or double deposits. If it’s not a website you recognize, then straight to the spam folder it goes. Data quality, selective targeting and a proper sending cadence are the main keys to strong deliverability. So unless you’re sending something highly inappropriate or terrible, words alone won’t necessarily damage your sender reputation. If you’re targeting the right people with engaging content at the right frequency, you should have no problem hitting the inbox. If your recipients trust your brand and are always excited to read your emails, you could probably use just about every spammy word on our list and still hit the inbox, because your contacts will still interact with them and all of your user engagement metrics will look great. What are some other words you typically avoid using in your subject line? Or misleading subject lines you see used by spammers? Share them with us on Twitter. This blog post is an updated version of the post “Words That Will Trip The Spam Alarm“, published on the Mailjet blog on December 4th, 2014 by Rad Penchev.